Are you looking for the best way to watch the U.S. Navy Flight Demonstration Squad airshow, the Blue Angels, in Annapolis, Maryland? With an increase in visitors and restricted traffic patterns surrounding the U.S. Naval Academy Commissioning Week events, traveling by water is the best way to fully enjoy the spectacular airshow. See the performance by charter with Cruise Annapolis; our dedicated team will help you book your charter experience. Zephyr Deux to Join the Cruise Annapolis Fleet! The Cruise Annapolis team has just returned from a busy 5 days at the Miami International Boat Show, and in addition to the general excitement of the show, we were also able to celebrate some fantastic yacht deliveries! 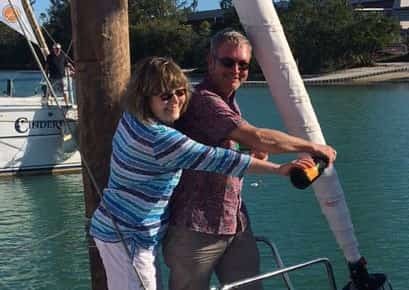 One particular celebration involved Susan and Chip Fitzpatrick and their new Jeanneau Sun Odyssey 490, Zephyr Deux, which will be joining the Cruise Annapolis fleet!